I lingered at the top of Ventoux for half an hour or so, savouring the glow and the malt loaf and enjoying the company of friends after so long on the road on my own. Every now and then a gust of wind would shake the van, and we’d all remember – and marvel – that this tiny bubble of warmth and conviviality was perched on the summit of a mountain, and there was nothing but darkness above and below. I had arrived at five minutes to midnight, Marion told me, as she stamped and signed my brevet card – meaning that I had covered the distance from Geraardsbergen to Ventoux in under three days. And, since Juliana’s departure, I was now leading the women’s field. But now I couldn’t decide what to do next. I knew that the descent would probably be almost as challenging as the climb, with weakened arms and gusting winds, and without the warmth generated by pedalling. Perhaps I should call it a night, seek out a sheltered corner at the top of the mountain, and ride down to Sault after I’d slept a few hours. But experience tells me that starting a day with a descent is a bad idea – riding through the Balkans in the winter of 2011, I’d once spent the first hour of the day shivering uncontrollably as I rolled downhill into freezing fog, and then had to spend even longer thawing out my fingers and toes in the first cafe I found. Ever since then I’ve been careful to camp at the start rather than at the end of long climbs, so I can get my blood flowing properly first thing in the morning. Shortly before I left the checkpoint a cheerful young Norwegian named Kristjan arrived at the van, displacing the rather more doleful German who’d been sitting there on my arrival. By now I was thoroughly revived, and we animatedly compared notes on our appalling eating habits over the last few days, as Kevin and Marion listened with increasing disgust. He had taken to ordering two pizzas at a time, and turning them into a sandwich (I wished I’d done that four hours previously, in Aubignan), and told me that he was managing to get a reasonably balanced diet out of his Macdonald’s stops, by ordering two meal deals at a time, one with fries and milkshake, the other with salad and orange juice (I made a mental note). He was planning to carry on to Sault that night, and told me that if I waited for a few minutes, we could descend together. A more rational Emily would have known full well that company makes not the blindest bit of difference when the terrain is daunting or dangerous, but as it was I happily accepted, and shortly thereafter we reluctantly stepped back out into the ravening wind, slammed the van door closed behind us, and shivered as we swung our legs over our bikes. Within seconds Kristjan was gone, dropping like a stone down the road ahead of me, and I was staggering helplessly as the wind caught me once again, almost throwing me back against the tower. Feeling no less feeble than I had when I arrived, I meekly dismounted, wheeled my bike down the first few metres, and then began rolling carefully down the mountain, my left foot hovering an inch from the ground; my exhausted arms twitching and trembling as they gripped the brakes for all they were worth; my whole body poised for the moment the wind decided to pick me up and hurl me into the jagged scree slope to my left. This wasn’t much easier than going up had been, and knowing that it was only going to get harder, as cold and exhaustion set in further, I decided to go only as far as Chalet Reynard, to sleep there for a few hours, and to complete the descent in the morning. I inspected the cluster of darkened buildings, aware that I might stumble across other furtive wild campers, but keen to find one of the few elusive spots that would be out of the wind. I drew the line at breaking into one of the outbuildings, so instead parked my bike in a corner of the veranda, spread my bedding out on the concrete floor, put on my compression socks and my waterproof jacket and gloves, got into my sleeping bag and lay there, very nearly warm enough, looking up at the stars, listening to the wind rumbling and roaring all around me, and savouring the satisfaction of what now lay behind me, with very little thought for what lay ahead. Eventually, inevitably, I fell asleep. Minutes (or hours?) later I was briefly awakened by the unmistakable sound of a Campagnolo drivetrain, accompanied by footsteps, and the muttering voices of a couple of other racers looking for somewhere to sleep. To and fro it went, for several minutes, until a brief blaze of light against my closed lids told me someone had shone their front light or head torch directly into the corner where I was lying, and after that the voices abruptly stopped, the drivetrain faded off into the distance, and I dozed off again. I woke up before dawn, and carried on down the mountain, with the sense I always have after a big pass, and suspect is partly imaginary, of having crossed some border, breached some boundary, and now being in a new world, with a new landscape to marvel at; new customs to learn. As the light rose around me a vaster, more sweeping, more austere terrain revealed itself. I left the pine trees behind me and sank down into the golden fold of Provence that harboured Sault and – I fervently hoped – my breakfast. I joined a small knot of Transcon racers hovering outside a soon-to-open boulangerie, and then, fortified by hot pastry, set off into the mountains. A few hours later, at the apex of a long sunny climb, I looked back at the summit of Ventoux, now bathed in sunlight, its white scree looking almost like snowfall, and thought about how far off it already seemed, not only in distance, but in time and temperament. The red van was probably still up there, and Marion and Kevin might even now be stamping the brevet card of some exhausted racer, congratulating them on making it to Checkpoint 1. But their climb would have been very different, and they – and indeed, most other people – would never have any idea of the sight and sound of Ventoux at night. My few hours up there in the darkness already felt like a dream, or a secret, that few would ever share, and that even I myself now struggled to recall with any accuracy or sincerity. It was a glorious morning, and the road, as I followed it east towards Sisteron, was intermittently busy with local cyclists. Every now and then a group of them would rush past me, and once or twice I glanced behind me to find a couple of them furtively slipstreaming. I stopped in a small village for my second breakfast, leaving my bike unlocked among the many others outside the cafe, confident that I was among friends, and no one would steal it (and that it was a lot grubbier than any of the others, so probably wouldn’t be a thief’s first choice anyway). Amazing efforts. I am loving following your dot. I did it for about 2 hours in meetings today (boring). Also enjoyed armchair following you up Mt Ventoux last night immensely. J said ‘surely she’ll wait until tomorrow morning? But… it’s DARK now’. There was a text from my sister in Oxford, with a photo of the meal she was eating while she clicked refresh every three minutes and my dot crawled slowly forward along the winding red line that was the road up the mountain. And over on Twitter was an announcement of my ascent from uber-dotwatcher Jack Thurston. Up in Scotland, my hosts from the Edinburgh Festival of Cycling told me they’d been willing me on all evening, and cheering (quietly, so as not to disturb their neighbours) when I finally made it to the top. A man I don’t even know said he’d used Streetview to virtually ride the last 5k alongside me, and congratulated me on my success. 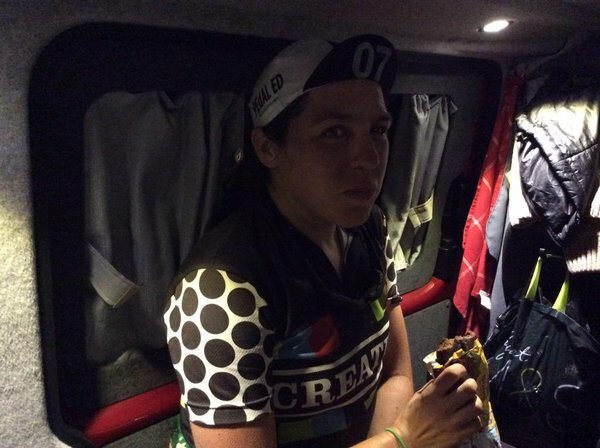 Marion had posted a picture of me, sitting in the van with my malt loaf, and I was surprised, as I sometimes am after a difficult period on the bike, to see that I looked very much like the self I’ve always been; that there’s little external evidence of the extremities to which I’ve dived on the inside. All of a sudden, sitting in that sunny cafe, surrounded by chattering French families and old men in lycra, I found I was back on the mountain in the dark. Except that now the whole experience was revolutionised, because all around me in the darkness, floating just out of sight, were dozens of people watching me, willing me on, wishing me well – just like Sarah’s invisible peleton; just like the imaginary cyclist whose hand (in the form of a tailwind) occasionally rested against the small of my back, boosting me gently upwards. I had attempted to haul my exhausted self up the mountain by calling on the strength and support of stronger people and, although I was unaware of it at the time, it had been there all along. And a screenshot that showed my dot where it was right now: following what was apparently an unnecessary detour through the mountains, while everyone else’s streamed north-east along a valley. Oh dear. I had better get back on the bike.